Dr Lilya Andrianova is a Postdoctoral Research Associate at the University of Exeter (funded by the BBSRC) where she investigates the interneuronal influence on the neurocircuitry between different brain structure, such as nucleus reuniens (a thalamic nucleus), hippocampus and several cortical areas using various electrophysiological methods. 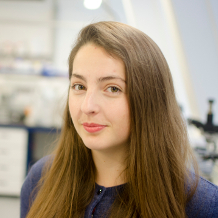 Lilya is also interested in the molecular and cellular changes driving the process of ageing prior to development of age-related diseases. Dr Andrianova graduated from the University of Warwick in 2012 with a BSc (Hons) in Biochemistry. She continued her studies at Warwick, receiving a PhD in Biological Sciences in 2016, after which she joined our group in early 2017.